I was feeling a bit low about my art work being rejected from a juried show, so my daughter and I decided to make some art together that was uplifting. I hope that by putting this artwork in the hallway, it would help remind me that sometimes there are downs, as well as highs, in life. But if you keep Allah* in your heart, He opens windows when doors are closed. 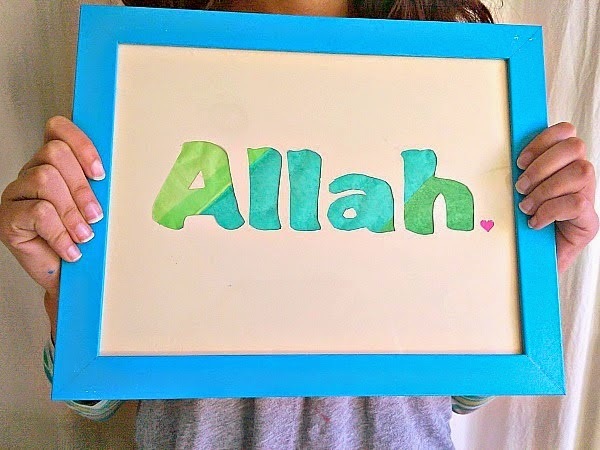 *Allah is the Arabic word for God and used by Arabs all over the world, regardless of their religion. 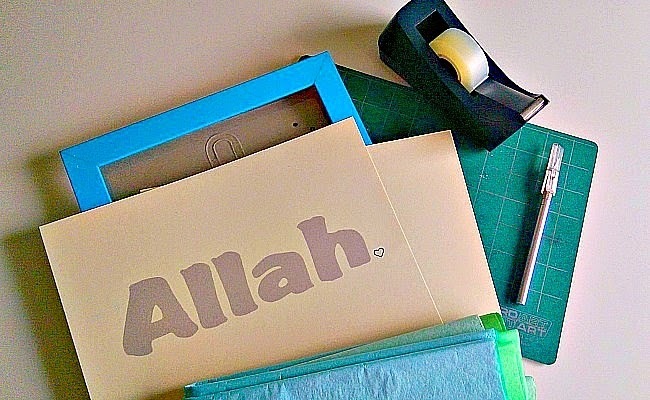 We printed out the word Allah very large on beige cardstock. Next to it, we also added a little heart. 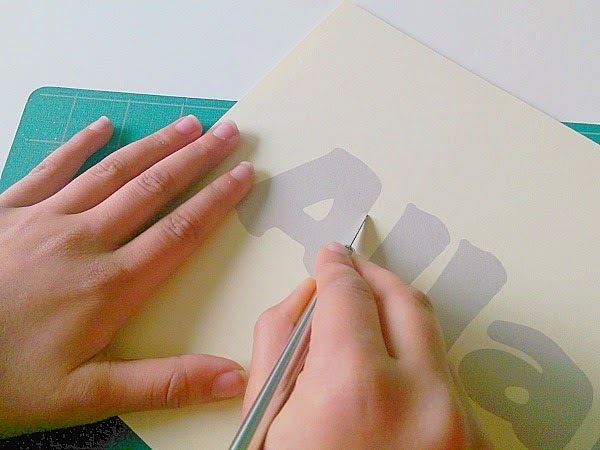 Cut out the word very carefully with the Xacto knife. 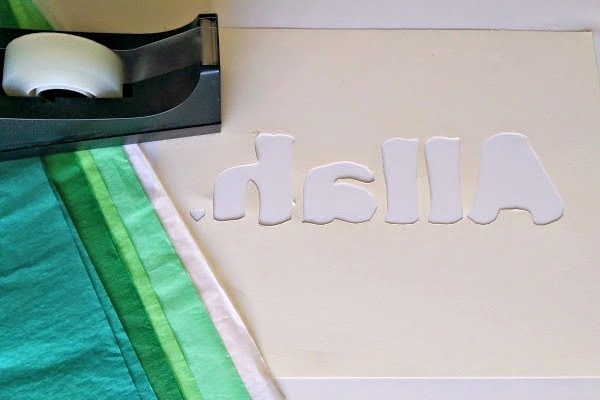 Once all your letters are cut out, be sure to save the insides of any letters that you use, flip your paper over. 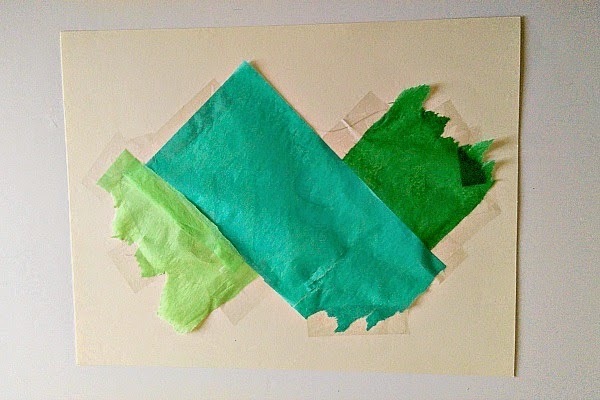 Start playing around with the color and design of your tissue. Rather then just have each color cover one letter, we decided to make them diagonal. Don’t worry about how you tape down the pieces once you are happy with your design. This will all go in the back and be unnoticed. I would recommend cutting the tissue with Xacto, but as you can see, my daughter got too excited about the design and used her hands to tear. 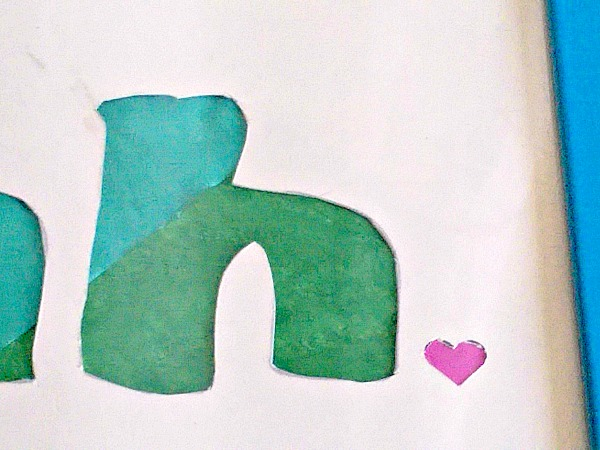 We turned the paper over and added the middle of the two A’s with tiny pieces of folded over tape. We also made sure to add a little pink tissue for the heart. Your frame is done and ready to hang! 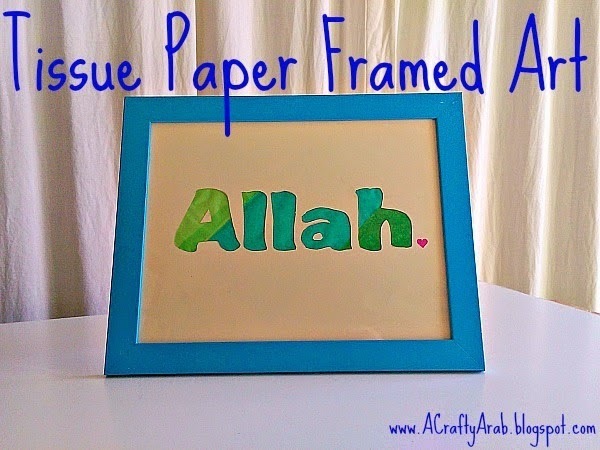 Regular readers to my blog will recognize the frame from our Begin Everything With Bismillah Frame we made last year. Truth of the mater is that I love these picture frames from IKEA and always buy them in bulk. They instantly add color to your artwork and we use the blue and red in our home quite extensively. Feel free to use different sized frames and words for a montage in your home!